Association for Consulting Expertise (ACE) - Webinar: Is conflict an opportunity for organizational success? Webinar: Is conflict an opportunity for organizational success? How do we move from Conflict to Collaboration? Poorly managed conflict can take a huge toll on organizations and individuals, often damaging morale and undermining productivity. But with the right skills, conflict can be a source of innovative solutions to problems and enhanced relationships that contribute to satisfying workplaces. Participants in this webinar will learn a specific methodology and set of skills to transform conflict into a positive force for individuals and the organization in which they work. Differences themselves, when approached constructively, have the power to be the source of great benefits, both to the groups and individuals involved and to the organizations in which they occur. Organizations sustain huge losses - tangible and intangible - due to poorly managed and often destructive conflict. When approached with an integrated set of tools and skills, the richness of diverse views and perspectives can be the basis for creative solutions that drive success instead of incurring costly losses and for building a 'conflict competent' organization. Dana Morris-Jones possesses a combination of insight about what makes organizations successful and the ability to help others resolve differences constructively. After completing a Ph.D. in Counseling Psychology and training in group dynamics from NTL Institute for Applied Behavioral Science, Dana worked as an internal consultant to a large gas & electric utility as it faced massive change brought about by deregulation. Before starting her own consulting practice, she trained and became certified as a mediator. In the years that followed, Dana built on social psychology, organization development, conflict resolution and, more recently, neuroscience, to help leaders, managers and all members of organizations build consensus and achieve alignment to move their organizations forward. As a principal in The Delphi Group, Dana and her partner John Shorb continue to apply these insights and practices when helping clients grow high performing organizations. The Delphi Group is a member of ACE. 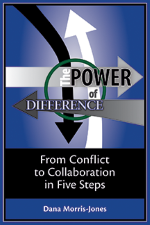 In 2016, Dana published her book, The Power of Difference: From Conflict to Collaboration in Five Steps, which is the basis for a class offered to high ranking federal executives at the Federal Executive Institute Leadership for Democratic Society. Please note this webinar is on a WEDNESDAY not Tuesday. This webinar is free to ACE members and only $15 for non-members. The webinar will be recorded and provided to registrants.